"Error" and all dash lights flashing, Fan Turns on, No Start…. My educated guess is the horn caused your problem not being wired through a relay. Modern electrics and CAN BUS are fragile. The soundbomb mini is advertised at pulling 5 amps, and the bigger one is said to be 20 amps. Apparently on the KTM 1190, hooking the mini straight to the harness causes a fault because the bike only expects a 1 amp draw from the horn. Looking at our wiring diagram, it looks like the horn is wired directly to the dash, without a fuse in between. srikz, check your fuses first. Hopefully it is just a blown fuse. Whenever you get it fixed, you should put a relay on that horn. I am 100% certain that this is a fuse issue! I had the exact same thing happen to me. It's the fuse block underneath the right hand cover, 10 amp fuse. I was running my high beam, and heated grips on high (they draw more current than the OEM ones), and managed to blow my fuse when riding home in a rain storm. Huuuge mistake continuing on as long as I did, I should have stopped to notice not only was my dash dead, but none of my lights worked! They will if you push them to. It's a published TSB, so should be fairly easy to get it covered. SMC Sheffield worked with ducati to diagnose and repair - ducati covered parts with no quibble, which were dashboard and coils. Shop assumption is that the new coils are updated since 2013 model and it will have been fitted with those - anyone able to verify? Should be to install the CANBUS filter. Yes, that happened immediately when I pressed the horn button. Now waiting for the dealer to get back to me on this issue. How could a simple aftermarket horn cause so much pain?! The horn of hyper is one of reasons. 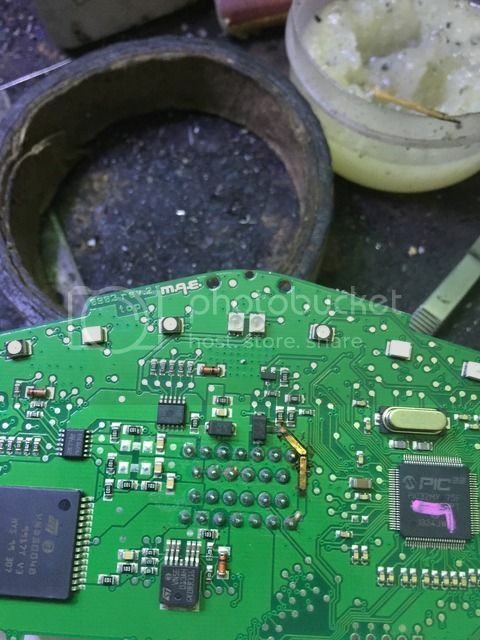 The burned track on pcb is GND of horn. it happpened to my 2013 strada today this am,just stalled out at traffic light and bike completely no respond,had to tow bike home on truck. not sure what to do at this point.i will call dealer and make appointment tomorow. my strada not get can-bus filters done yet ! i wonder if this will burn many components on the bike ??? So bad, I hope your bike is not out of warranty because the cost is 1200$ for the dashboard. Got a call from the dealer today, it was indeed the mini sound bomb which was messing up the electronics. Asked them to remove it and revert to stock. They are gonna install the original stock horn and test everything again. Hoping it just ends there and nothing is fried internally. Does anyone know where I can buy a compatible relay, the dealer was not sure. A loud horn is really helpful on Indian highways.